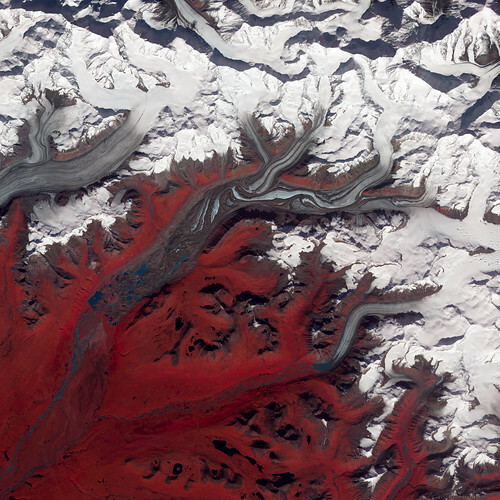 Like rivers of liquid water, glaciers flow downhill, with tributaries joining to form larger rivers. But where water rushes, ice crawls. As a result, glaciers gather dust and dirt, and bear long-lasting evidence of past movements. Alaska’s Susitna Glacier revealed some of its long, grinding journey when the Advanced Spaceborne Thermal Emission and Reflection Radiometer (ASTER) on NASA’s Terra satellite passed overhead on August 27, 2009. This satellite image combines infrared, red, and green wavelengths to form a false-color image. Vegetation is red and the glacier’s surface is marbled with dirt-free blue ice and dirt-coated brown ice. Infusions of relatively clean ice push in from tributaries in the north. The glacier surface appears especially complex near the center of the image, where a tributary has pushed the ice in the main glacier slightly southward. A photograph taken by researchers from the U.S. Geological Survey (archived by the National Snow and Ice Data Center) shows an equally complicated Susitna Glacier in 1970, with dirt-free and dirt-encrusted surfaces forming stripes, curves, and U-turns. Susitna flows over a seismically active area. In fact, a 7.9-magnitude quake struck the region in November 2002, along a previously unknown fault. Geologists surmised that earthquakes had created the steep cliffs and slopes in the glacier surface, but in fact most of the jumble is the result of surges in tributary glaciers. Glacier surges—typically short-lived events where a glacier moves many times its normal rate—can occur when melt water accumulates at the base and lubricates the flow. This water may be supplied by meltwater lakes that accumulate on top of the glacier; some are visible in the lower left corner of this image. The underlying bedrock can also contribute to glacier surges, with soft, easily deformed rock leading to more frequent surges. NASA Earth Observatory image created by Jesse Allen and Robert Simmon, using data provided courtesy of NASA/GSFC/METI/ERSDAC/JAROS, and U.S./Japan ASTER Science Team. Caption by Michon Scott.